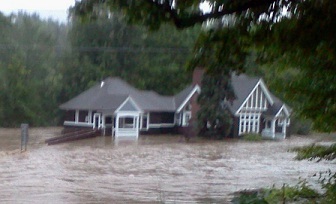 This page contains all of the information and photos posted on our site during the 2011 Flood situation. Thanks again to all those who helped get us re-opened so quickly! Wells Memorial Library will re-open Saturday, January 28th, 11am - 4pm. Please join us to celebrate: 1-3pm, refreshments and music! Note: Due to the overwhelming support we have received from the community and various sources across the nation, we have received HUNDREDS of book donations, at this point in time we can no longer accept anymore book donations due to the size of our library and lack of storage facilities. We would like to take this time to thank all of the support we received thus far from the community, those who have donated books, as well as the publicity and all those who shared our story. We look forward to reopening as soon as possible. The following photo is a picture of ALL the books we've received as donations thanks to all of you! 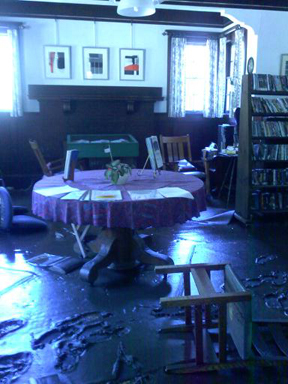 Due to damages from flooding resulting from Hurricane Irene the library is currently closed for cleaning and repairs until further notice. If you would like to volunteer to help with the cleanup, you can either stop by the library or email us at [email protected]. 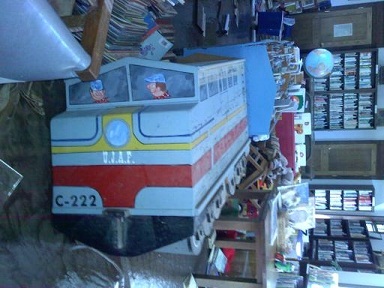 All of the picture books and a large number of other children's books are gone. 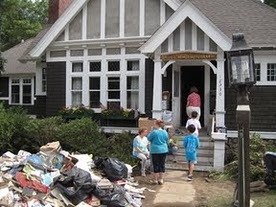 We are accepting monetary donations by mail to P.O. Box 57, Upper Jay, NY 12987. For those of you that have borrowed items from Wells Memorial Library, you may hold on to them until the library reopens. If you have borrowed books from other libraries please return them to the loaning library or another library in the Clinton-Essex-Franklin Library System.